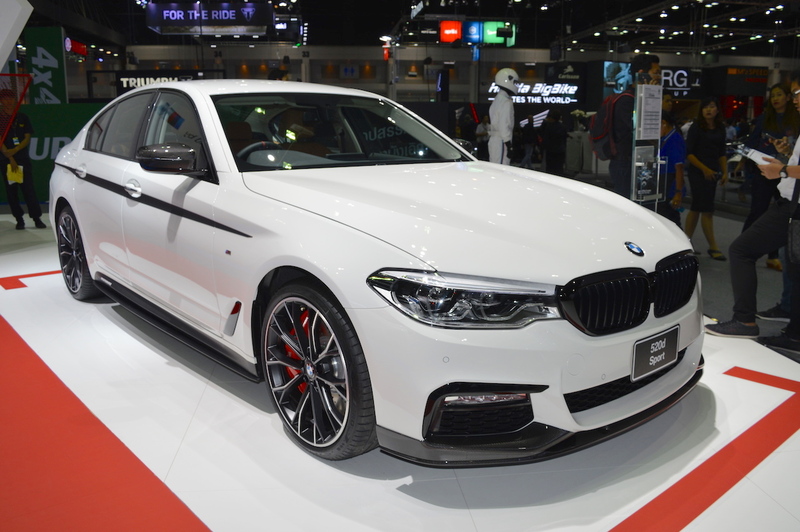 BMW is displaying an accessorised 2017 BMW 5 Series at the 2017 Thai Motor Expo. 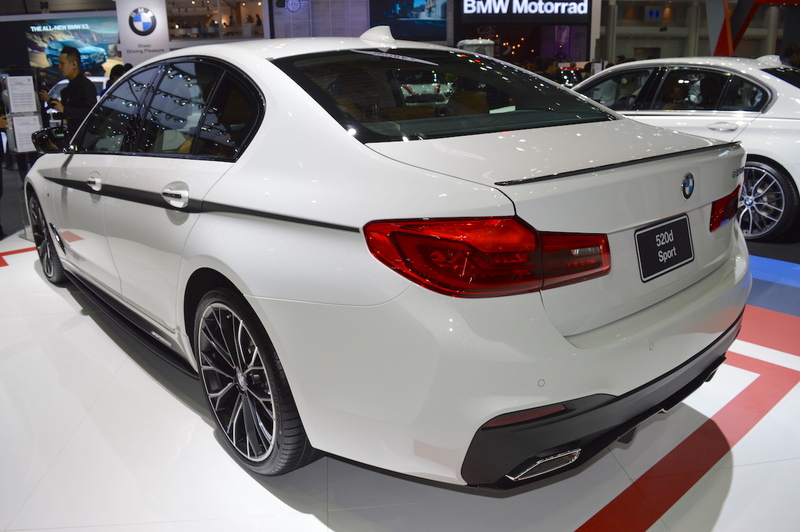 The seventh generation BMW 5 Series was launched in Thailand in February this year. The 2017 BMW 5 Series seen in the images is fitted with a slew of BMW M Performance accessories. The executive sedan sports carbon-fibre front splitter, carbon-fibre front spoiler, 20-inch BMW M Performance two-tone alloy wheels in a two-level, double-spoke design, M Performance-branded side skirt adhesive films, high-gloss Air Breather, M badge on front quarter panels, accent stripes on the sides, carbon-fibre mirror caps, carbon-fibre rear spoiler, carbon-fibre rear diffuser with rear bumper trim and chrome exhaust tips. Inside, the accessorised 2017 BMW 5 Series features Dakota leather upholstery, BMW M Performance stainless steel pedals and BMW M Performance sports steering wheel. The 2017 BMW 5 Series with BMW M Performance Parts is in the 520d Sport configuration. It is powered by the 2.0-litre BMW TwinPower Turbo diesel engine that produces 190 PS at 4,000 rpm and 400 Nm of torque from 1,750-2,500 rpm. The 8-speed Steptronic automatic transmission is standard. No fitment of the xDrive AWD system means that drive is channeled to the rear wheels. The red brake callipers with M branding indicates that stopping power is provided by BMW M Performance sports brake system consisting of with 4-piston fixed calliper aluminium brakes at the front and single-piston floating calliper brakes at the rear. The 2017 BMW 5 Series 520d Sport costs 34,39,000 Baht (INR 68,01,499.27) in Thailand.